TSRJC notification 2020 – 2021 pdf, apply online for inter admissions : The Telangana Residential Educational Institution Society-TREIS has released the tsrjc 2020 notification for admission test for providing admission into 1st year Intermediate Programmes in 35 TS Residential Junior Colleges (15 for Boys & 20 for Girls) for the academic year 2020-21. These Gurukulam colleges have only MPC, Bipc and MEC groups. You can check the TSRJC CET 2020 Notification from the official web portal tsrjdc.cgg.gov.in. tsrjc applications 2020 will be started from the 12th March 2020, So candidates can check tsrjc eligibility criteria before the apply. TSRJC admission test are scheduled to be conducted on 10th May 2020 in District Head quarters of erstwhile districts. Candidate must have studied in Telangana region only. Candidates Must have passed the 10th class in first attempt in March, 2020 only. Previous years students are not eligible and need not apply to tsrjc exam. All candidates must have GPA of 4 in English. TREI Society is managing 35 TS Residential Junior Colleges across Telangana. Out of 35 Residential Junior Colleges 15 for Boys and 20 for Girls , available groups are MPC, BPC, MEC and CEC. colleges list are as follows. Candidates want to join in Residential Junior Colleges for the academic year 2020-21 have to apply for TSRJC 2020 Common Entrance Examination through online mode only by visiting official website tsrjdc.cgg.gov.in. Hand written / Typed / Photostat copies / printed Application forms will not be accepted and such applications are liable for rejection. 1. 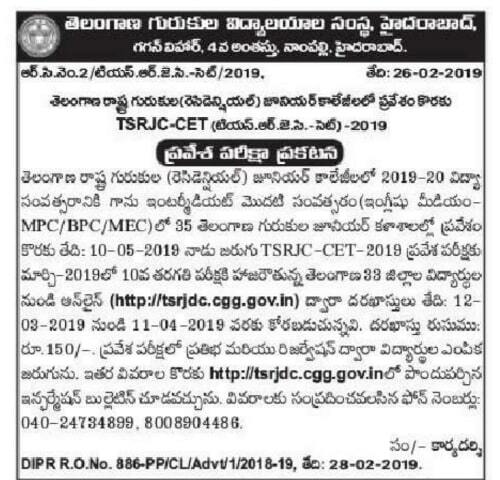 Candidates seeking admission into Inter I year in 35 TS Residential Junior Colleges for the academic year 2019-2020 have to apply for TSRJC Common Entrance Examination through online by visiting http://tsrjdc.cgg.gov.in. i. The candidate shall first go through the information bulletin carefully and satisfy their eligibility for appearing for TSRJC-CET 2020.
ii. The candidate after satisfying himself/ herself about the eligibility criteria for the submission of application through online shall pay a fee of Rs.150/- through ONLINE or through Credit card (Payment gateway) from 12.03.2020 (after 4.00pm) Last date : 11.04.2020 for submission of application through Online. iii. At the ONLINE CENTER or PAYMENT GATEWAY (By Credit Card/Debit Card) the candidate has to give the required preliminary data (i.e. Name of the candidate, Date of birth and mobile number). iv. On receipt of fee at ONLINE or PAYMENT GATEWAY, the candidate shall be issued a Journal Number with which she/ he can proceed with submission of application through online through the website http://tsrjdc.cgg.gov.in. Issue of Journal Number does not mean that the candidate has completed submission of application online. It is only a confirmation of the fee received. vi. Candidate who are appearing for SSC Board Examinations have to Enter the hall ticket Number while filling the online application. Once HT number is entered, the data and photo of the candidate will be captured online. Data not available in SSC Board data shall be entered by the candidate. vii. The applicants ( other than SSC Board ) shall follow the procedure for submission of online application as given in the ‘Information Bulletin’ and also as per the instructions provided online while filling up the online application form. The Candidate should be ready with photograph of size 3.5 X 4.5 cms. Before filling in on-line application. The Photo should be scanned and uploaded along with the application form. viii. While filling the online application, the candidate has to opt for the course. Once a course is opted, that cannot be changed. ix. The applicants may not posses any certificate at the time of application, but they must obtain original certificates (Caste, Income, Study, Special category) by the time of counselling. x. On submission of application ONLINE, the candidate has to take a copy (print) of application form in which a reference number is given. This Reference number is required to download the Hall Ticket. The copy of online application is to be preserved for further reference. xi. For any mistakes/ incorrect information, the candidate is solely held responsible. Hence, they must take utmost care while filling the online application. xii. The Applications of the ineligible candidates will be summarily rejected. xiii. The selected Candidate must produce the original certificates mentioned in the application at the time of admission. xiv. The selection of the candidate will be summarily rejected if they fail to submit the necessary documents at the time of admission. TSRJC Question paper shall be issued in Telugu medium and English medium or Urdu medium and English medium (bilingual) only. The admission test is of completely objective type with 2½ hrs duration for 150 marks. The candidates have to mark their answers in the OMR sheets. TSRJC Model Question papers are available in the TSRJDC Website. TSRJC CET Syllabus : The officials will set tsrjc question papers will be based on 10th standard in Telangana state syllabus for subjects and here English will be considered as General English. TREI Society is going to conduct exam on 10th May 2020. Candidates who submitted their tsrjc application forms on or before 11th April 2020 can download the TSRJC hall tickets 2020 from the official site http://tsrjdc.cgg.gov.in/. Check your exam date and venue after downloading the tsrjc cet hall tickets 2020. Take a print out of Admit Card before your exam date. TREI Society will plan to release the TSRJC Entrance Exams results on its official web portal tsrjdc.cgg.gov.in. The society has conducted the exam in May 10th, 2020 for the candidates who had filled and submitted the tsrjc application forms. Candidates who attended for the tsrjc cet written test are waiting for the results, click on the tsrjc 2020 Results link given below to check your result. TSRJC Counselling 2020 will be starting in the month of May. TSRJC CET was conducted on 10th May 2020 and its result was declared. Now, the selected students are awaiting for the notification of TSRJC CET Counselling which is expected to begin from 28th May 2020 at 35 different residential junior colleges in Telangana. The counseling procedure will be regulated by the TSREIS. 14 Postal Address : H.No. 4) Gold, silver or lead, which is ………………….? Identify the right option to fill in the blank. 2) If – 6x – k is exactly divisible by x – 3, then value of k is ……………. 3) The point lying on x-axis and equidistant from (3, 5) and (4, 2) is ……. 2) Magnetic quantum value for 24th electron is ………..
3) Concentration of ore does not include…………………. 4) The number of isomers possible for Hexane are …………. 2) The alkaloid used as antimalarial drug is ……………. 3) The hormone secreted to suppress the hunger is …………………. 1) The Shivaliks in Assom are known as…………..
3) During the year 2004-05, the percentage of employment in organized sector was………………. 4) The food grains purchased and kept in stock by the Government of India through FCI is called……………..
5) The state of atmospheric conditions over an area at a particular time is known as………..